The mechanism of cross-presentation enables professional APCs to induce CD8 T cell-mediated immune responses against exogenous Ags. Through this mechanism, APCs can induce either immunity against infectious pathogens or tolerance against self-Ag residing in extralymphatic locations. An unanswered question in this field concerns the identity of the cross-presenting APC. All major classes of professional APCs, particularly dendritic cells, macrophages, and B cells, have previously been shown to be able to cross-present Ags in vitro. In the present study, we have created transgenic mice where MHC class I expression is driven selectively in dendritic cells and provide direct in vivo evidence that dendritic cells are sufficient to cross-present exogenous self-Ags and induce Ag-specific cell division of CD8-positive T cells. CD8 T cells are important immune mediators against malignancies and intracellular pathogens such as viruses. These cells recognize Ag presented by MHC class I molecules, which generally only present protein Ags synthesized within the presenting cell (1, 2). This Ag presentation pathway is known as the endogenous pathway, in contrast to the MHC class II-restricted pathway, which presents exogenous (extracellular) Ags to CD4 T cells. However, recent studies have demonstrated presentation of exogenous Ags also to CD8 T cells in vitro (3). Such “cross-presentation” has now been observed in many tolerogenic as well as immunogenic responses in vivo (3, 4, 5, 6), albeit its actual contribution to the functioning of the immune system remains controversial and seems to be Ag-dose dependent (7). Theoretically, this mechanism could enable professional APCs to induce CD8-mediated immune responses against viral, tumor, and self-Ag from nonlymphatic tissues, which lie outside the migration pathways of naive T cells. Thus, it may prevent viruses that do not infect professional APC from escaping immune surveillance (8), allow antitumor responses against nonlymphatic malignancies (4), and induce peripheral tolerance against nonlymphoid self-Ags (5). After several reports that dendritic cells (DC)4 play a major role in processing and presenting peptides from dying cells to CD8 T cells (9, 10), it has been speculated that this APC type might be the principal cross-presenting cell (11). In vitro work has demonstrated that, depending on culture conditions, all major types of APCs, namely DC, macrophages, and B cells, are able to cross-present exogenous Ags (3, 9, 12, 13, 14). Recent in vitro findings also indicated that DC are more potent in cross-presenting exogenous Ag to CD8 T cells than macrophages or B cells (9, 15, 16). However, it is unknown which type of APC is responsible for in vivo cross-presentation. Therefore, we have used an in vivo approach employing the well-established rat insulin promotor (RIP)-membrane-bound OVA (mOVA)-transgenic mice, to identify the cross-presenting APC. In these animals, where the model self-Ag OVA is expressed under the control of the RIP, OVA expression can be detected in the pancreatic β cells and proximal kidney (17). Bone marrow-derived APCs in the draining pancreatic and kidney lymph node constitutively cross-present nonlymphatic tissue-derived OVA. When OVA-specific transgenic CD8 T cells (OT-I cells) are injected into these mice, the T cells are activated and proliferate exclusively in these draining lymph nodes. By generating mice in which only CD11c+ DC can activate OT-I cells, we demonstrate that dendritic cells are sufficient to cross-present self-Ags in vivo. The cDNA encoding mouse β2-microglobulin (β2m) was amplified from total spleen cDNA of C57BL/6 mice using the oligonucleotides 5′-TCAGCATGGCTCGCTCGGTGACC-3′ and 5′-ATGCTTGATCACATGTCTCGATC-3′. This PCR product was ligated into the blunt ended EcoRI site of the previously described vector CD11c-pDOI-5 (18). 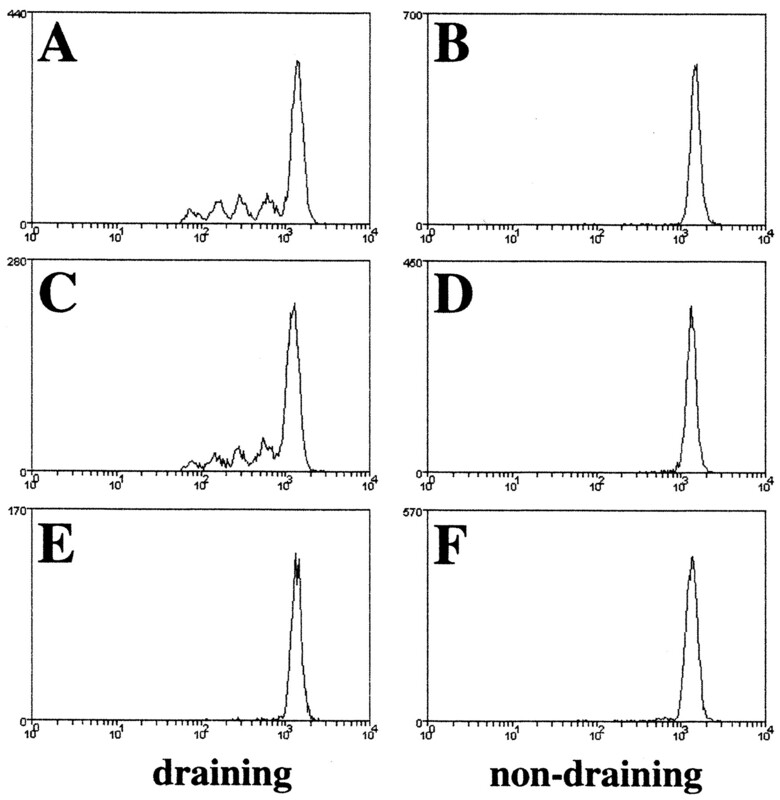 The orientation and integrity of the β2m-cDNA was controlled by DNA sequence analysis. The linearized transgenic construct, devoid of vector sequences, was microinjected into the pronuclei of fertilized oocytes from (BDF1×BDF1) F1 mice, and transgenic offspring were subsequently identified by Southern blotting. We obtained four different founders with varying copy numbers and a similar transgene expression pattern. The founder line with ∼20 transgene copies was bred for six generations to C57BL/6 mice and then for another four generations to β2m-deficient animals (19), which had themselves been backcrossed for 11 generations to C57BL/6 mice (The Jackson Laboratory, Bar Harbor, ME). We will refer to these animals in this study as CD11c-MHCI mice. OT-I and RIP-mOVA.bm1-transgenic mice have been described previously (5). All mice were bred and maintained at the animal facilities of the Medizinische Hochschule Hannover, the Max Planck Institute of Immunobiology, Freiburg (under special pathogen-free conditions) and the Institute for Immunology, University of Munich. As described previously (17), 8- to 12-wk-old RIP-mOVA.bm1 mice were lethally irradiated with 900 rad. Approximately 12 h later, they received i.v. 5 × 106 bone marrow cells, which were depleted of T cells by anti-Thy-1 (T24.1; a kind gift of J. Kirberg, Basel Institute for Immunology, Basel, Switzerland) and rabbit complement (Cedarlane, Hornby, Ontario, Canada) treatment. As bone marrow donors, we used either C57BL/6 mice, CD11c-MHCI mice, or transgene-negative littermates (MHCI−/−). Preparation, CFSE labeling, and adoptive transfer of OT-I cells were conducted as described previously (5). PE-conjugated anti-CD8 (YTS 169.4) was obtained from Caltag (San Francisco, CA). All other Abs used in this study were purchased from BD PharMingen (San Diego, CA). With these mAbs, flow cytometry was performed on a FACSCalibur or a FACScan (BD Biosciences, Mountain View, CA) instrument. Single-cell preparation, staining, and FACS analysis were done according to standard procedures. Dead cells were excluded by propidium iodide staining. To analyze DC, organs of different mice were digested twice with collagenase (CLSPA; Worthington Biochemical, Freehold, NJ) for 30 min at 37°C as described previously (18). Cells were then recovered by centrifugation at 300 × g for 5 min, washed twice, and used for FACS analysis. To express MHC class I selectively on DC, we used a 5-kb fragment containing the promoter region of mouse CD11c (see Material and Methods). This DC-specific promoter has been described previously to drive transgene expression selectively in DC in vivo (18, 20, 21, 22). We cloned cDNA encoding mouse β2m into the expression cassette of this vector and obtained four different transgenic founder lines after transgene injection. These animals were backcrossed into the β2m-deficient C57BL/6 background (see Materials and Methods and Ref. 19), and transgene expression was monitored using MHC class I Kb-specific mAb AF6-88.5. Thereafter, these mice are referred to as CD11c-MHCI. Two different mouse strains were used as controls. Transgene-negative littermates of CD11c-MHCI mice were negative controls, because these animals correspond to normal MHC class I-deficient animals (19). They are devoid of β2m expression in all organs and are referred to as MHCI−/− in this study. The positive control mice were C57BL/6 mice, which were termed MHCI+/+. A representative FACS analysis of spleen and lymph nodes of these mice is shown in Fig. 1⇓. MHCI+/+ mice expressed MHC class I Kb in lymph nodes and spleen on both B220-positive B cells and on B220-negative non-B cells (Fig. 1⇓, MHCI+/+). In contrast, MHCI−/− animals and CD11c-MHCI mice did not show detectable MHC class I expression on either cell population (Fig. 1⇓, CD11c-MHCI, MHCI−/−). Expression of the CD11c-β2m transgene does not lead to detectable MHC class I Kb expression on lymphocytes from transgenic mice. Single-cell suspensions of lymph nodes (left) and spleens (right) of MHCI+/+, CD11c-MHCI, and MHCI−/− mice were obtained by teasing organs through a mesh. Cells were stained with mAbs specific for B220 (PE) and MHC class I Kb (FITC), respectively. Shown are all cells with the gates set on live cells only. The numbers shown in the right top corner represent the percentage of Kb-positive cells relative to the vertical marker in each dot plot. We next performed flow cytometric analysis on freshly isolated spleen cells (Fig. 2⇓) from the different strains, first gating on cells with relatively high forward scatter and intermediate side scatter signals (data not shown). When these cells where stained for CD11c and CD11b, we identified three major populations as described previously (23, 24, 25). These discrete populations were further analyzed for their MHC class II I-Ab and MHC class I Kb expression. As expected, none of the cell populations from MHCI−/− mice showed MHC class I Kb expression (Fig. 2⇓, right, all histograms, thin black line) above background autofluorescence levels (data not shown). Cells that are CD11c+CD11b− (population 1, Fig. 2⇓) have been reported to coexpress CD8α and DEC205, surface markers that are typical for lymphoid-derived DC (24). In this lymphoid-related DC subpopulation, MHC class I Kb expression was found to be identical in DC from MHCI+/+ and CD11c-MHCI mice (Fig. 2⇓, right, histogram 1). The CD11c+CD11b+ DC-population (population 2, Fig. 2⇓) is thought to represent mature myeloid-related DC and has been shown to be negative for CD8α and DEC205 (24, 25). In this population, MHCI+/+ and CD11c-MHCI DC expressed similar levels of Kb, while DC from MHCI−/− animals were Kb negative (Fig. 2⇓, histogram 2). As expected for DC, the CD11c+CD11b− and CD11c+CD11b+ populations expressed high levels of MHC class II I-Ab (Fig. 2⇓, left, histograms 1 and 2). In the majority of the third population (CD11c−CD11b+), we observed MHC class I transgene expression at levels only slightly above the background levels of MHCI−/− mice (data not shown). When this population was divided into three subpopulations according to their relative CD11c-expression (populations 3–5, Fig. 2⇓), we found the expected positive correlation between transgene and CD11c expression (Fig. 2⇓, histograms 3–5). Furthermore, as compared with the DC-typical high MHC class II expression observed in the CD11c+ populations (Fig. 2⇓, left, histograms 1 and 2), the picture became more heterogenous (Fig. 2⇓, left, histograms 3–5). The biphasic MHC class II I-Ab distribution argues for the presence of only a small MHC class II highly positive population. It has been described that the CD11c−CD11b+ population contains a rather heterogeneous mixture of myeloid cells as well as differentiating myeloblasts similar to those found in the CD11c+CD11b+ population (25). Therefore, one might speculate that the CD11c-β2m-transgenic construct leads to β2m expression and reconstitution of Kb on a small fraction of monocytes/macrophages. Another interpretation could be the presence of myeloid precursors in the CD11c−CD11b+ population that gives rise to cells in the myeloid CD11c+CD11b+ DC fraction (25). These cells could be CD11c dull and start to up-regulate the transgene. These observations were made in all mice examined so far. 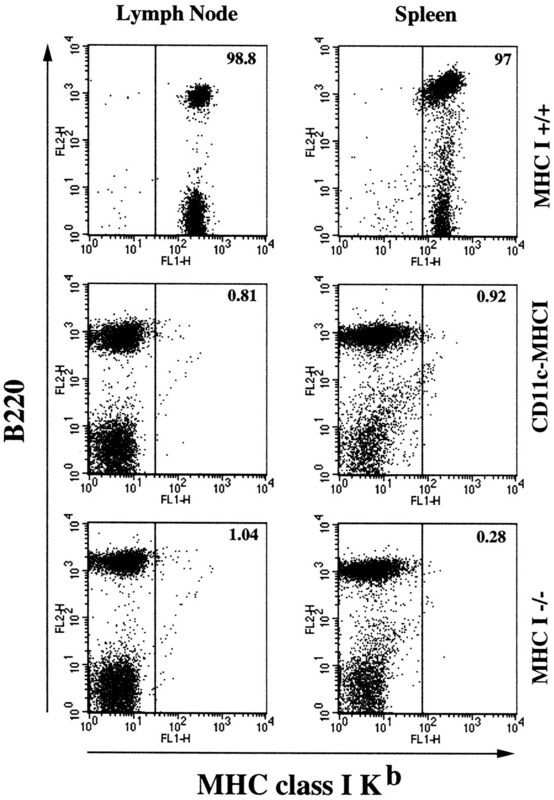 DCs derived from bone marrow cultures of CD11c-MHCI mice also showed wild-type levels of MHC class I Kb expression as compared with the MHCI+/+ control (data not shown). Lymphoid and myeloid DC in CD11c-MHCI-transgenic mice express wild-type levels of MHC class I Kb in vivo. Spleens of the three different mouse strains were collagenase digested as described in Material and Methods and analyzed by three-color flow cytometry. Data are presented for cells with high forward and side light scatter properties of DC. In the CD11c/CD11b staining (dot plot), gates were set on five subpopulations (gates 1–5), through which the relative expression of MHC class II I-Ab (left, MHC class II) or MHC class I Kb (right, MHC class I) was analyzed. 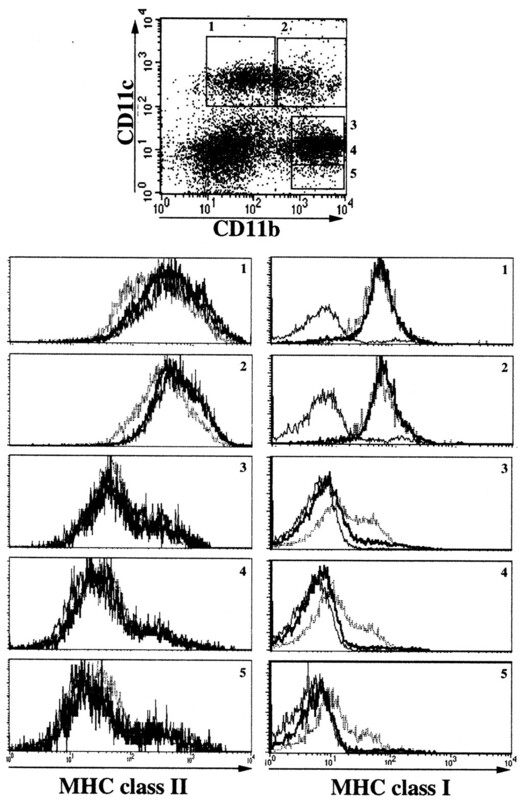 In the histogram overlays, the stainings of MHCI+/+ (dotted line), CD11c-MHCI (bold black line), and MHCI−/− mice (thin black line) are compared. In conclusion, the Kb expression in CD11c-MHCI mice seemed to be restricted to DC of the myeloid and lymphoid lineage and to a minority of CD11c−(dull)CD11b+ cells of the myeloid lineage. In contrast, as found by others (H. Goldstein, unpublished observations) and by us (18, 21), the CD11c promoter did not lead to transgene expression in the majority of myeloid cells or B cells. To generate RIP-mOVA mice in which only DC can activate OT-I cells, bone marrow from CD11c-MHCI mice was transplanted into RIP-mOVA.bm1 mice (CD11c-MHC I→RIP-mOVA.bm1). These recipients express the mutant bm1 of the MHC class I molecule Kb, which cannot present OVA to OT-I cells (17). After introduction of CD11c-MHCI mouse bone marrow, only DC present OVA in a Kb-restricted manner. As controls, we engrafted bone marrow from transgene negative littermates of CD11c-MHCI mice (MHCI−/−→RIP-mOVA.bm1) as well as from C57BL/6 mice (MHCI+/+→RIP-mOVA.bm1). In MHCI−/−→RIP-mOVA.bm1 chimeras, no OVA presentation should occur due to the absence of MHC class I on APC. In MHCI+/+→RIP-mOVA.bm1 chimeras, all bone marrow-derived cells are able to present OVA via Kb. CFSE labeling allows monitoring of cellular proliferation by detecting the dilution of this fluorescent dye as a consequence of cell division. When CFSE-labeled OT-I cells were injected into CD11c-MHCI→RIP-mOVA.bm1 mice, their division could be detected in renal lymph nodes 2 days after transfer (Fig. 3⇓C). This proliferation was comparable to that observed in MHCI+/+→RIP-mOVA.bm1 control mice (Fig. 3⇓A), in which all bone marrow-derived cells express Kb. In MHCI−/−→RIP-mOVA.bm1 control mice, which differ from CD11c-MHCI→RIP-mOVA.bm1 mice by the lack of transgenic Kb expression in DC, no proliferation was observed (Fig. 3⇓E). Thus, the activation of OT-I cells in CD11c-MHCI→RIP-mOVA.bm1 mice depended on the expression of the transgene. No proliferation was detected in the nondraining inguinal lymph nodes of any experimental mice (Fig. 3⇓, B, D, and F), demonstrating that activation of OT-I cells was Ag specific. Consistent with this interpretation, no proliferation was observed in CD11c-MHCI→bm1 mice (data not shown), which express Kb on the same cells as CD11c-MHCI→RIP-mOVA.bm1 mice, but lack the model Ag OVA. To avoid an influence of the OT-I cell number, we used a very high dose of CFSE-labeled OT-I cells. Consequently, the peak of undivided cells is relatively large as compared with the percentage of proliferating cells. Because an equivalent number of OT-I cells were driven into cell division and the number of divisions was identical in both the MHC+/+ and CD11c-MHCI (Fig. 3⇓, A and C) draining lymph nodes, we concluded that the CD11c+ DC (Fig. 3⇓C) were cross-presenting. The above experiments do not formally exclude the possibility that other bone marrow-derived APC can potentially participate in cross presentation in vivo. A definitive answer to this question would require mice deficient for MHC class I only in DC. Secreted, exogeneous OVA is cross-presented in the draining lymph nodes by DC of CD11c-MHCI mice and induces Ag-specific proliferation of CD8+ OVA-specific T cells. A total of 4 × 106 OT-I cells were labeled with CFSE and injected i.v. into either B6→RIP-mOVA.bm1 mice (A and B), CD11c-MHCI→RIP-mOVA.bm1 mice (C and D), MHCI−/−→RIP-mOVA.bm1 (D and E). Forty-eight hours later, the renal (A, C, and E) and inguinal (B, D, and F) lymph node cells were analyzed by flow cytometry. Negative littermates did not induce proliferation of OT-I cells (data not shown). Histograms were gated on CD8+CFSE+ cells. These results are representative of two experiments with three mice per each group. The question of whether lymphoid or myeloid DC are responsible for cross-presentation cannot be answered in our experimental system because all CD11c+ DC expressed the transgene. Thus, the different stimulatory abilities of these subtypes of CD11c+ DCs could not be distinguished. For the same reason, we could not differentiate between DCs at different stages of maturation, which also have been suggested to induce different outcomes of T cell activation (26). Nevertheless, our results demonstrate that DC are sufficient to cross-present in vivo and do correlate with in vitro findings where DC have been described to be much more efficient in cross-presentation than macrophages (9, 16) or B cells (15). Furthermore, they provide clear in vivo evidence for the hypothesis that dendritic cells are responsible for cross-presentation of self-Ags (11). The in vivo demonstration of this assumption, as achieved in the present study, suggests that the reported cross-tolerance by deletion of autoreactive CD8 T cells (5, 27), could also be induced by DC. If true, DC would represent not only central initiators of immunity, but also of tolerance. ↵1 C.K. is supported by a Heisenberg Fellowship and a research grant from the Deutsche Forschungsgemeinschaft (Grant Ku1063/2-1) and by research group grant of the German land Nordrhein-Westfalen. T.B. was supported by a Heisenberg Fellowship from the Deutsche Forschungsgemeinschaft (Grant Br 1889/1-1), a collaborative grant from the Jenner Institute for Vaccine Research, and the Deutsche Forschungsgemeinschaft Sonderforschungsbereich 364. ↵4 Abbreviations used in this paper: DC, dendritic cell; RIP, rat insulin promoter; mOVA, membrane-bound form of OVA; β2m, β2-microglobulin; CD11c-class I mice, mice expressing β2m, and thus MHC class I under the influence of the CD11c promoter on dendritic cells; OT-I cells, transgenic OVA-specific class I-restricted CD8+ T cells.